Simon Rich has a knack for making writers over 30 feel bad about ourselves. He was a published author at 22, followed that up by becoming the youngest Saturday Night Live writer ever, and at just 26 has just published his first full-length novel entitled Elliot Allagas. He recently swung through Toronto for a reading and q&a session, where he shared behind-the-scenes tidbits with SNL fans and had fellow writers pondering that, perhaps, we should work a tad harder. Rich kicked things off by satisfying the audience’s thirst for the current hot SNL topic: Betty White. He admitted that everyone at the show was nervous to have her in the office, and showed up with combed hair that Monday. She put everyone at ease, though, and proved to have more stamina than any other host, to a startling degree. “We went from being super-inspired, to weirded out by her raw strength,” he said. The team of Rich, John Mulaney and Marika Sawyer were responsible for one of the episode’s highlights: the NPR Delicious Dish redux starring Ana Gasteyer and Molly Shannon. Like most young comedy nerds, Rich says he became obsessed with the Simpsons and Kids in the Hall when he was younger. He ended up at Harvard, where he was “a terrible student”, and spent his five years (yes, five) practically living in the Lampoon offices, “fighting to get into a magazine that nobody reads”. His academic pursuits may not have been top-notch, but they were at least unique. “I took three different classes about medieval medicine,” he said, satisfying one corner of his wide-ranging set of interests (also including a fascination with killer robots). While at the Lampoon, he submitted to seemingly every publication under the sun. His mail was sent to the Lampoon offices, and the weekly readings of his rejection letters became something of an event among his colleagues. Eventually, those rejections turned into sales, a book deal with Random House, and the gig on SNL. He started back in 2007, with the Lebron James episode being his first. His inaugural sketch – which was cut – featured Bill Hader and Amy Poehler as a couple who’d purchased a memory foam mattress, with him complaining to the store because it always had a Lebron-sized dent in it. He says the actors write 50% of the show – something unique to the current era of SNL – but can’t be credited due to union regulations. The official writing staff ballooned to 20 people this season, making it even more difficult for first-year writers to get their sketches to air. He says he’s still nervous to pitch ideas, even as a relative veteran. Writers are employed on 6-month contracts, so the competition is always there. Many writers head home after the Monday pitch meeting, but Rich stays behind and writes for 10 hours to get a head start. 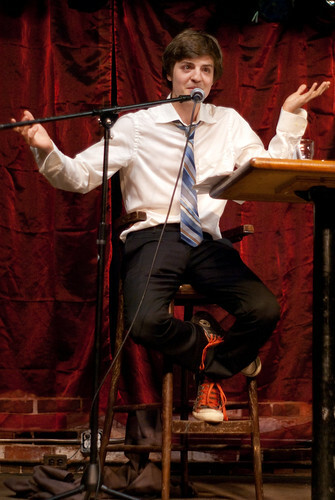 He writes primarily alongside Mulaney and Sawyer, who he says complement each other perfectly. He credits Sawyer’s insistence on using the Tom Cochrane song Life Is A Highway as the reason why Rocket Dog sketch from 2009 resonated so well with viewers. He says he gravitates towards writing for Andy Samberg, because he writes a lot of growing-up sketches and Andy makes a great kid. As well, Hader is great for working in high-stakes scenarios that follow a “dignity, dignity, slash-and-burn” pattern. Rich shed some light on the rituals surrounding dress rehearsal. Each sketch is viewed from “under the bleachers”, with the writers of it standing beside Lorne (the one most responsible for the sketch stands closest). Lorne sits with his headphones on, and yells out criticisms while the sketch is going. It’s up to the writers to take those notes and fix their sketch before air. But out of everything run through during dress, three sketches will be cut before air regardless. The biggest threat to a sketch is when something gets an audience reaction other than a pure laugh — applause or “awws” are sketch-killers. Rich’s secret to writing on SNL – and writing in general – is to write, write, and write some more. Even if it’s terrible. “I’m a quantity over quality kind of writer,” he says. He’s not kidding about the quantity part: he writes for three hours when he gets up, every day, seven days a week – sometimes following that up with a few more hours in the afternoon. He treats it like a job, he says. He found it fun to write premises that are a little more complicated than the three-line ideas he generates for SNL. He’ll get a chance to expand them even further, as Jason Reitman optioned the novel and Rich will write the screenplay over the coming months. “Doesn’t mean it’ll get made, just means that he bought it, and that I have a summer job,” he said. Rich may have grabbed onto the brass ring as far as comedy writers are concerned, but he’s still the black sheep of his literary family (father Frank is famed New York Times columnist, and brother Nathaniel is a critic at the Paris Review).